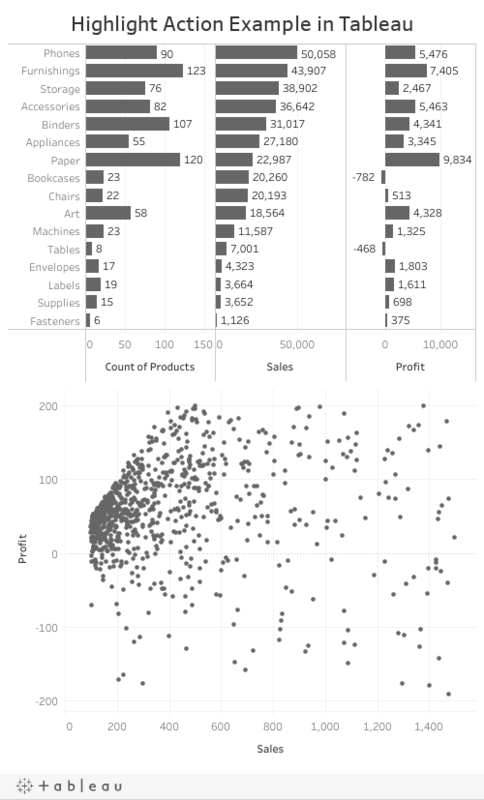 Let’s have a look at the role model first: Highlight Actions in Tableau. The visualization provides only one simple, but very helpful Highlight Action: if you click on a Product Category in the upper view (one of the bars or a row header), all related data points (i.e. all products belonging to this sub-category) will be highlighted in the XY Scatter Chart. To reset the selection, either press ESC or click on the selected sub-category again or click somewhere outside of the first view. Unlike Tableau, Excel does not provide a built-in feature to create Highlight Actions. However, with a simple charting trick and a few lines of VBA code, you can replicate Tableau’s Highlight Actions in Excel, too. The dashboard uses a horizontal layout (instead of a vertical one as in the Tableau visualization above), but the data and the views are exactly the same. You can select a sub-category by directly clicking into a cell of the left view or flip through the rows with the up and down arrow on your keyboard or by pressing ENTER or Shift-ENTER. To undo the selection, click somewhere outside of the left view or simply press ESC. So much for a short overview of the implementation. The workbook and VBA code is open without password protection. If you are interested in the details, please download the workbook (download link see below) and have a look for yourself. If you have any questions, please leave me a comment.